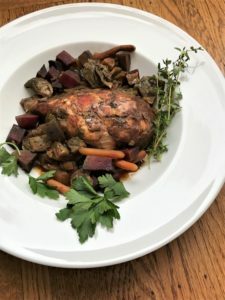 Crockpot marinated chicken with beets and Brussels sprouts is a wonderful dish to prepare on a chilly fall or winter night. 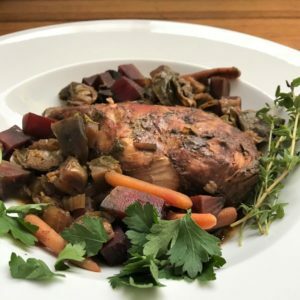 Whenever I use a crockpot or slow cooker, I want recipes that involve minimal prep. This recipe is one of those. 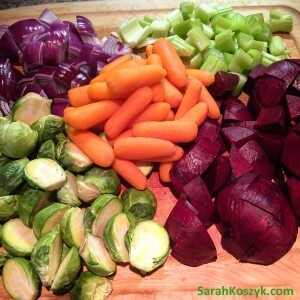 In addition, the beets, Brussels sprouts, celery, and carrots contain a rainbow of colors to enhance your nutritional benefit. The meal provides you with 130% of your daily value of Vitamin A, 126% of your daily value of Vitamin C, and 24% of your daily value of Iron. Here’s to delicious taste and fabulous health. 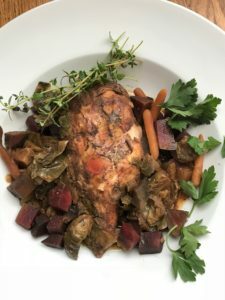 Crockpot marinated chicken with beets and Brussels sprouts is a wonderful dish to prepare on a chilly fall or winter night. 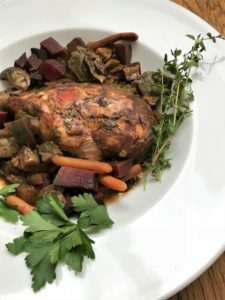 Whenever I use a crockpot or slow cooker, I want recipes that involve minimal prep. This recipe is one of those. 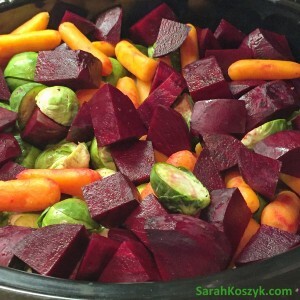 In addition, the beets, Brussels sprouts, celery, and carrots contain a rainbow of colors to enhance your nutritional benefit. 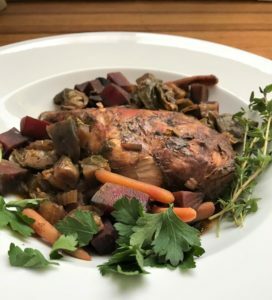 The meal provides you with 130% of your daily value of Vitamin A, 126% of your daily value of Vitamin C, and 24% of your daily value of Iron. Here’s to delicious taste and fabulous health. In a small bowl, make the marinade. Whisk the thyme, Dijon mustard, vinegar, salt, and pepper. Cut the Brussels sprouts in quarters and again in half (so you get about 8 pieces from one sprout). In a large Ziploc bag, add the chicken and the Brussels sprouts to the marinade and refrigerate for at least 30 minutes to overnight (I like marinating it overnight so the next morning, I have less prep). Mince the garlic. Dice the onion. Chop the celery. Peel the beets and cut into small cubes. 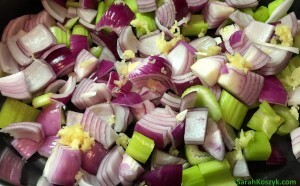 Place the onions, celery, and garlic in the bottom of the crockpot. 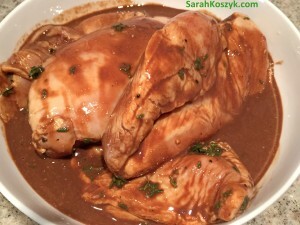 Place the chicken with the marinade on top. 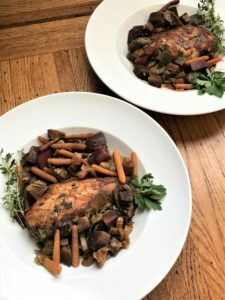 Layer the carrots, beets, and Brussels sprouts around and on top of the chicken. Cover and cook on LOW for 8 hours. Serve. One of the more healthiest meals that can be prepared. Thank you. I accidentally overcooked the chicken!! 🙁 But the veggies turned out amazing so I just snacked on those! Thanks for sharing!